I recently left the bustling city of Los Angeles and headed into the hot desert to visit the Westin Mission Hills Resort and Spa. 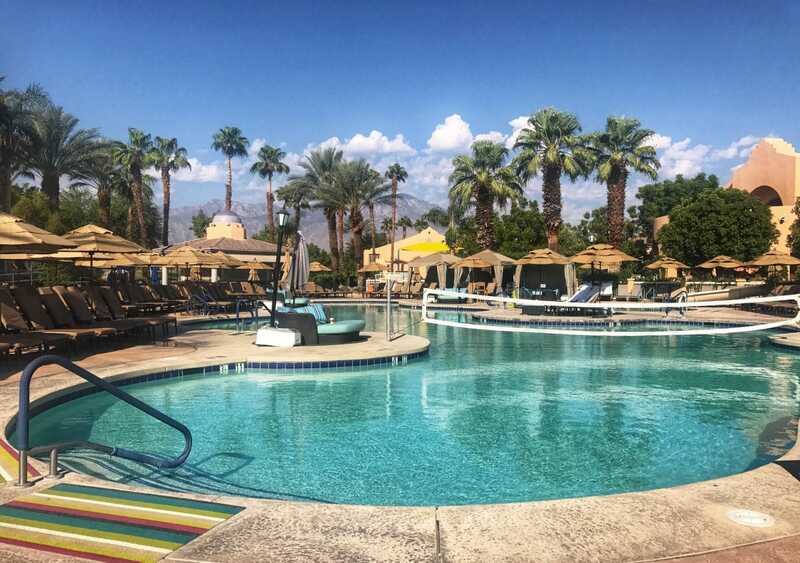 The resort itself is easy to find and just far enough outside Palm Springs that you will truly feel like you are in a desert oasis. Set on 360 acres of landscape this 512 room, AAA four-diamond resort offers spacious guest rooms and suites, over 65,000 square feet of meeting space, two championship golf courses, an intimate spa, seven lighted tennis courts, three pools, and spectacular views and service. Upon checking in I headed to my room which had a large, king-size bed and a stunning bathroom with a spacious, walk-in shower and bath tub. All rooms have a flat-screen TV and a variety of satellite channels and WiFi. I was also happy to find a welcome gift with amazing cookies and treats from Dilbert’s Honey. My room had an incredible view of the property. Perfect for families, “Las Brisas,” is the largest pool, with a new 75-foot waterslide, two bubbling spas, and pool attendants at your service throughout the day. The adult (18+) pool “Las Hadas”, has recently undergone renovation. It offers cool decking, one spa and a bar. If you’re looking for somewhere quiet to relax, check out “La Paloma,” the resort’s quiet pool. Poolside cabanas are available for rental in the adult pools (Las Brisas and Las Hadas). The Workation Cabana Package includes two nights accommodation with one day of a poolside cabana “office” from $386, a 32% savings off normal room rates. Each furnished cabana includes WiFi, a refrigerator stocked with Coke products and bottles of water, choice of two lunch selections from the Workation menu, a box of office essentials supplied by Office Depot (to keep), as well as use of a waterproof safe, rolling table workstation, power strip and laptop lap desk with pillow cushioning and cooling fan. When you get tired of swimming, grab a bite at the Las Brisas Cafe or Caliente Bar, where they offer healthy salads, sandwiches, burgers, snacks, cocktails, beers and much more. For dinner I’d suggest the Pinzimini Restaurant – with Italian inspired cuisine, they will enliven your senses with delightful savory sensations. You can lay around the pool all day or visit the spa, play golf or tennis or exercise at the fitness center. The spa offers options to satisfy every desire. You can revive your skin with a spa facial or treat your body a massage and tip it up with a manicure and perfume. Listed as one of Golf Digest’s® Top 75 Golf Resorts in North America, The Westin Mission Hills Golf Resort & Spa is truly a golfers dream. It features two championship Troon golf courses: the Pete Dye course and the Gary Player Signature Course. I had the opportunity to play with the lovely, Barry. When you’re tired of playing golf, you can visit the spa for a pamper session. Located in the heart of Palm Springs and was originally founded in the 1930s. Since opening, their focus has shifted from a broad spectrum of topics to an emphasis on art, photography, and architecture. Many of the exhibits are personal collections provided by Palm Springs’ wealthy residents. Aerial Tramway is an extraordinary ride over the majestic Chino Canyon. Take in the scenic views of the landscape from two and half miles above the desert. For $5 you can enter the magical living world of Moorten’s Botanical Garden, where cacti, succulents and other plants bloom in all their glory. Skip the rental car and grab a scooter instead—with easier parking, you’ll see more and have way more fun. Find a good map of old Hollywood stars’ homes and get going; we recommend rentals through Scoot Palm Springs. The area around Palm Springs is dotted with amazing hikes that let you explore the wonders of the desert. Visit the world’s largest fan palm oasis in Palm Canyon, hike the ancient trails of Tahquitz Canyon all the way to a 40-foot waterfall, or discover silence in the secluded Murray Canyon. Whichever hike you choose, bring as much water as you can carry, and be sure to wear layers and sunscreen . Bring a map (but don’t obsess over it), and beware of rattlesnakes!